We are available to provide support and advice to any vets and other rescue organisations about any aspect of the welfare, health or care of an Italian Greyhound or Italian Greyhound cross. Download our Introduction to Italian Greyhounds and the Rescue Charity. Compared to most breeds of dogs in this country, Italian Greyhounds are still a relatively rare breed and as a result vets and other rescues may find themselves in a situation where they need to call on the experience of other specialists who have the experience of dealing with Italian Greyhounds. If you are a vet we are more than happy to put you in touch with other veterinary specialists e.g. Orthopedic Surgeons who have experience in dealing with specific issues affecting Italian Greyhounds. 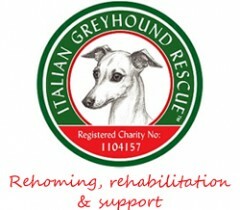 If you represent another rescue organisation please do contact us if an Italian Greyhound or Italian Greyhound cross is placed into your care. We may be able to assist with advice on the breed and with potential foster homes or adoptive homes. In either case please contact: info@italiangreyhoundrescuecharity.org.uk.